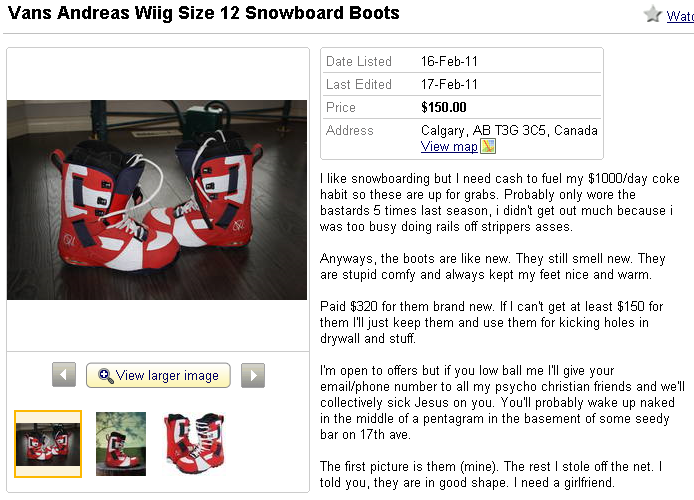 I like snowboarding but I need cash to fuel my $1000/day coke habit so these are up for grabs. Probably only wore the bastards 5 times last season, i didn't get out much because i was too busy doing rails off strippers asses. Anyways, the boots are like new. They still smell new. They are stupid comfy and always kept my feet nice and warm. Paid $320 for them brand new. 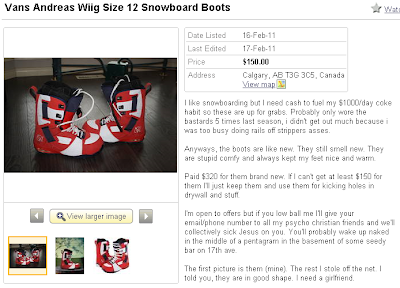 If I can't get at least $150 for them I'll just keep them and use them for kicking holes in drywall and stuff. I'm open to offers but if you low ball me I'll give your email/phone number to all my psycho christian friends and we'll collectively sick Jesus on you. You'll probably wake up naked in the middle of a pentagram in the basement of some seedy bar on 17th ave. The first picture is them (mine). The rest I stole off the net. I told you, they are in good shape. I need a girlfriend.